So the pieces are supposed to be fixed internally and loose against the body panels? I just used thin 0.7mm galvanised sheet cut to shape and reused the rubber edge trims. Ok, that should work. Riveted in place on one side then. That's fine, I also gave mine a spray coat of underbody schutz/waxoyl for extra protection. That looks a very neat solution. Thanks. Now got the car running well. New thermostat fitted with the air filter back in means it runs and idle's well. Having found my manifold has, in the past been badly repaired, I have the car booked in to be welded and repaired. So I have some time to do some smaller jobs. I need to look at new seatbelts as mine are quite worn. Has anyone found any modern replacements? 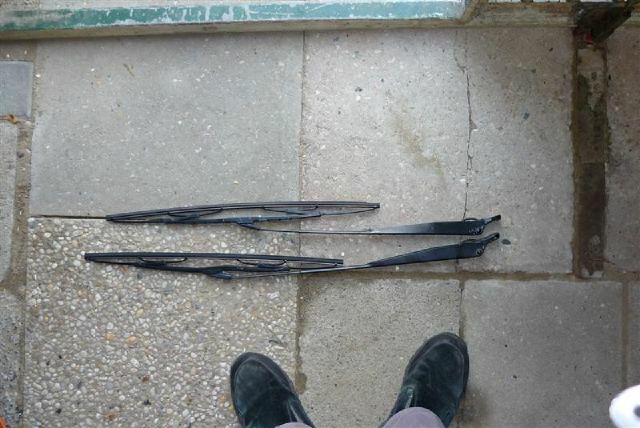 Also I need to replace my rusty windscreen wipers. Are there any from other cars that will fit? Yep. Ford Ka 1 perfect fit. The old safety belts are real bad on most Murena's. They snap off with minor force after 30 years of use. I still use the belts, but at a scrapyard found some locks wit soft parts that fitted. Can't remember what car but try some and you will find. Very nice, the steel cable no longer stick in my *ss when driving. Thanks Herman, the wipers look good. I need to change both the belts and the anchors I think as they are all worn too much. I need to look at the mounting points as I have a set of VW ones I'd like to try and use. 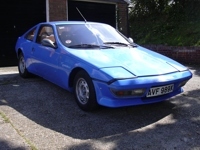 You may find that you can't obtain the left-hand drive Ka wiper arms easily in the UK. Citroen BX arms will fit, they are straight like the originals. I have to admit I hadn't even realised that Pete! Thanks. Of course, the wiper base is probably angled for left or right hand drive. Can't find any BX arms yet though. However I've now found a few more bits to fix. I've long thought that the front of my car must have had some light impact at some point as so little seemed to line up. Now that I have dropped the bumper off I see why! Originally all the bracing struts in the headlamp wells were missing, as were the two cross braces inside the front wheel arches. The front wing had started catching on the drivers door and showed evidence of old damage. When I took off the bumper there was a lot of cracked panels and missing braces. Some self-tapping screws had been put in the the light housing and side of the bumper to screw it together as these braces were missing. When I started to fit the braces, it was obvius that the front bumper support had been bent at both sides. I dont have time to start repairing the fibreglass immediately, I am concentrating on trying to align the panels and braces better. But it looks like later this year I will have to learn how to patch some of these panels! From the photos the damage to the fiberglass does not look too bad. The parts do not look like they are mis-aligned to one another, so it should be possible to clean it, sand it with a rough grain, apply epoxy and glass matting and more epoxy, on the inside. If the cracks are visible from the outside, apply some plastic padding with glass fiber fill and sand it smooth. When painting, apply a high quality epoxy primer that guarantees water tightness. Otherwise the paint might bubble up from moisture in the fiberglass. I have fixed my bumper a couple of times that way and plan to mould the top and front to align with the body, so no rubber mouldings are necessary. I have seen others do that and like the look. The bend frame is a more serious matter. I don't know if anyone has the frame measurements, or know where the alignment points are. I have now realised how badly the front bumper was attached now that I have spent the day rebuilding the front. I've put all the bracing pieces back on both sides, renewed all the bolts and straightened it all as much as possible. It was so bent that it took me an hour to get the bumper off. Now it slots on and off in minutes. The front end panels are now fully attached and it feels 100% stiffer and stronger.